In the end, I decided to do the series in the month of November, only this time around, I’m going to simplify it to something that can be done in 30 minutes or less per day. We’ll mostly be following along with the 4 Weeks to a More Organized Home series that I initially posted, but it will be a much more simplified version. Beginning Monday, I’ll post each day’s assignment at 9 a.m. EST and then have the link-up for you to share your pictures, posts, and comments at 6 p.m. EST each day. I’ll only be posting assignments on weekdays and we’ll be skipping the week of Thanksgiving — so the series will actually last five weeks total and will run from November 5 to December 7, 2012. Leave a comment below and let us know if you’ll be joining in! I can’t wait to be inspired by you all! I need this!! It’s going to go right along with my 21 days theme too because I’m working on organizing! This is great! I will definitely be joining in! I couldn’t participate very much last time because we were in the middle of a complete home remodel, so I’m really glad that you are doing it again! I’ve been thinking about going back and doing the other one all by myself, but this will be so much better doing this with everyone else to encourage and support me! 🙂 Thanks for taking time out of your busy schedule to do it! I really appreciate it! Yay! I’ve been looking around my house, and thinking I need to get some things done! And I admit, I thought of MSM and wished there was a upkeep series going on right now. Now there is! Great timing. 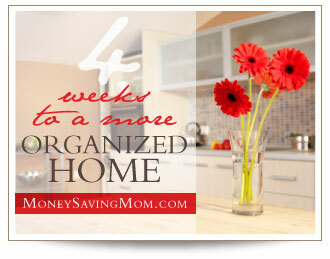 Our homes will be organized for the holidays! Loved the last one! Completely changed how I approach housecleaning, however after reading 21 Days to a Disciplined life last weekend I came up with my own Mega Project to get my home cleaned attic to main floor by Christmas, so I am going to have to sit this one out so I can get that project done. I will be reading it though for inspiration to keep going with my own 8 weeks of cleaning. I got my first room done by mid week this week, doubt it will happen every week, but it was a great motivation booster for me. I’d love to join, I really need this! I’m in! Missed it the first time and looking forward to it! I so excited you are doing this again. I didn’t do it the first time, but I regretted that I did not participate…. now I get the chance. I’m joining in–this will be perfect for getting prepared for the holidays and family coming to visit in December. Joining In!!! Looking forward to it!!! Jumping in…we’ll see if I’ll have the discipline to hang in there (hmm…maybe I should do the 21 day challenge first…)! Thank you!! I definitely need this and will be joining in, I didn’t fully participate last time because of some things happening, so this will be great and just in time for the holidays !! I’ll definitely be doing this! We moved 2 months ago and while we are unpacked, we aren’t organized yet and I’m having trouble getting into a good routine. Hopefully this will help me. I’m gonna try this too! If I can just do a little bit every day, it will still be better than it was yesterday! Really appreciate it, I have made significant progress but ….well let’s just say I have room for improvement. This sounds like exactly what I’m looking for. I was just looking for more getting-organized help from your site but wasn’t sure if I should commit to the full deal of the 4 Weeks series. But I am in for this version! Thanks! We just found out that we are moving across country before Christmas, to me this is perfect timing! I’m definitely in! I am homeschooling 4 kids, working from home about 35-40 hours a week, and we (read that as “I”) make all our food from scratch. So my house is just a mess right now! I need those so badly, and have been really working hard to get it organized. I would love to have it done by Christmas so that I can have Christmas Eve at my house this year. Perfect timing! Definitely in!!!! It is a blessing you are doing this!!! Thank you! I need this! We moved in August and welcomed our 3rd child in September and have been living in chaos. I’m so excited for this series! It’s coming at a perfect time since we’re spending more time inside now! Great idea to prep for the holidays. I loved this last time and will definitely be joining in. Thanks! I’m in, I did the 4 weeks challenge in August, and I could afford to do it again already! I think I can handle 30 minutes a day…thanks for doing this, Crystal! I need to be holiday ready so yes, I will be following! I’m in!!! Sounds like something I really need to do! Great timing for this. I was just thinking the other day I need to do a little extra cleaning and organizing before the holidays. I am so thankful you will take the week of Thanksgiving off too. Thanks for hosting this again. I so need this right now!! Really looking forward to the simplified version!! I have enjoyed your ebook 21 Days to a More Disciplined Life. Love your website!! Thanks!! I did not do it last time but enjoyed reading the posts. I am going to do it this round. I have a birthday for my twins on the 17th so this can help me get the house ready. I love home organization. Count me in! I feel like you always post things that are just right for me! Love it! Love this idea. 30 minutes is a perfect amount of time and I like that it’s just weekends. I’m so excited! Thank you for doing this Crystal! P.S. If I ever have a day where I feel like I can’t fit it in, I’ll think of all the people without homes because of Sandy and will feel blessed that I have a home to take care of and reside in. Amen! What a great perspective and reminder! I am in!! Sounds great! I loved this challenge the first time you did it. Afterward the month was up, I took the big project you gave each day and made a list of them. Some of yours didn’t apply to my home and then I had other things in my home you hadn’t mentioned that needed attention. I made a personalized list of 20 tasks to do for deep cleaning. I’ve committed to do them every 3 months- January, April, July, & Oct. I just finished my 3rd time doing it since you had done your challenge in the spring. I never had trouble keeping up with routine house cleaning, but your challenge helped me to work on those deep cleaning & organizational tasks. I’ve found that keeping up with them several times a year makes them MUCH easier than some of them were the first time I did the challenge with you (like the oven, blinds, & windows). Thanks for all you do. I love your blog, and you inspire so many people. Oh yes, I will definitely be participating! I need this so much. My home has gone to complete chaos. I AM READY!!! Sounds very fun. I will try to write or chime in the comments on days I do some of the tasks you post. I am also trying to not over extend myself in too many project. This year is the first year we are hosting thanksgiving, so I’m trying to get prepared early for this busy season. With the help of your e-book and Jessica Fisher’s e-book A Simpler Season, I think I’ll be able to be more disciplined and organized. Plus, enjoy the holidays! I will be here also.. Have so much to do and don’t know where to begin.. This will give me a great incentive to get something accomplished!! I will be following along and I’ve encouraged all of my readers to follow along too! This is a great way to get your house in order before the chaos of the holidays begins! I always thought that after you finnished the last one I needed to start over each month! count me in, dealing with chronic pain and have started back to work, with your guidance & God’s grace I believe I can do this, thank you! I am so excited for this. I started it the first time around to get my home ready for our new baby, but then she came three months early so I never got to finish it. She is doing amazingly, and now my house soon will be too. Totally going to commit to this. Thanks! I would love to join I think last time you had this series I was busy having a baby. With 4 boys I could definetly use some orginizational skills. I am joining in….i need to get organized and if i can do it in 30 minutes a day. .well, that would be wonderful. Looking forward to the 4 week challenge. I love organizing, I’m in! Thanks!! 30 minutes or less a day to a more organized home?! I’m in!! Yay! I am so glad you are doing this. I am in! Im in. I skipped the last one as I was really busy. It would be nice to get some things cleaned up. I will be following along and possibly sharing 🙂 Is it possible to get a daily email with the task when you post it? I would love to have it sent to my phone email so I can just keep moving on with day and get it done when I have a chance. I don’t always make it onto my computer until later in the evening, so an email would really help! Thanks for doing the series, I can’t wait! Excellent timing! Count me in! I’m in!! So excited about this! Thanks for taking time to help the rest of us out!! Couldn’t follow along last time, but I plan to do my best this go-round! Some friends and I created a event where we can post daily pictures and hold each other accountable! Should be interesting. I’d love to be included. I am so busy right now…working 5 days and raising 5 kids. I need a little motivation to get organized for the holidays. I’m so in! I need this badly. Thank you!!! So, I really enjoyed the morning series, so I’m excited about this one. I’m not sure I’ll be able to post each day… or maybe that will be a good practice at discipline? Either way, bring it on! A great way to prepare for the holidays by cleaning my home. Thanks! I will be following; although I go to work at 8 AM and don’t get home until 4:30 PM, so I doubt I’ll get any pictures or comments posted. MEEE! I def. wanna join in !!!!! I’m in… 30 min or less I can handle right now! I am going to try to do this. What perfect timing we have had a CRAZY last few months. Moved, then a house fire, moved, and then moved, and finally getting our stuff back from being cleaned from the fire… all that a baby due on New Years eve so I need all the helpI can get I think the timing will be great for me! This is just what I need! !